Johns Hopkins University received a A+. Originally founded as a research university for graduate students, Johns Hopkins backed into undergraduate education in a way different from most elite institutions. More serious of mind than its Ivy League rivals, Hopkins hosts plays at the Division I level in only one sport: lacrosse. Indeed, the Hall of Fame for that sport is on campus. The rest of competition is purely for love of the game, in the Division III University Athletic Association. World famous for its medical school, Hopkins attracts a preponderance of pre-meds, and is eager for students of other disciplines, especially the humanities. Describe the type of student who should not attend Johns Hopkins University and explain why. Any student who is not dedicated to success or excellence and whom does not want to become successful should not come. Describe the type of student who should attend Johns Hopkins University. Why? A student dedicated to success at all levels of business should attend Johns Hopkins University because, as an MBA program and student, ambition is the key to one's goals. What is a typical Johns Hopkins University student like? Describe the type of person that should attend Johns Hopkins University. Hopkins kids are dedicated to their studies, but also know how to have fun. We're quirky and total nerds, but we're surrounded by our people and we love it. What are the top 3 reasons someone should attend Johns Hopkins University? What was a typical Johns Hopkins University student like in high school? Describe the type of person that should attend Johns Hopkins University. Academically, Hopkins is one of the toughest schools in the country, and the workload reflects this. The student body at Johns Hopkins is ethnically diverse and a significant international population is represented on campus. Give your application everything you've got. Renowned for its science and international studies programs. The university has nine academic divisions and campuses throughout the Baltimore-Washington area. The Krieger School of Arts and Sciences, the Whiting School of Engineering, the School of Education and the Carey Business School are based at the Homewood campus in northern Baltimore. The schools of Medicine, Public Health, and Nursing share a campus in east Baltimore with The Johns Hopkins Hospital. The Peabody Institute, a leading professional school of music, is located on Mount Vernon Place in downtown Baltimore. The Paul H. Nitze School of Advanced International Studies is located in Washington's Dupont Circle area. What are the top 3 things that students do for fun at Johns Hopkins University? JHU students love to study, complain about how hard classes are, and occasionally attend a world-class lacrosse game. Campus housing is available for undergraduates. Housing deposit : $200.00. Housing deposit due : May 30. Housing deposit is not refunded if student does not enroll.. No cars. No pets. 99% of students graduated in the top quarter of their class. 84% of students graduated in the top tenth of their class. The average student pays $21,308 for tuition, fees, and other expenses, after grants and scholarships. Total stated tuition is $45,470, in-state and on-campus, before financial aid. Learn more about financial aid at http://apply.jhu.edu/finaid/finaid.html. Estimate the net price for you at http://npc.collegeboard.org/student/app/jhu. The typical (median) early career salary of Johns Hopkins University graduates is $55,600, according to Payscale. Johns Hopkins University participates in the NCAA Division III for college athletics. 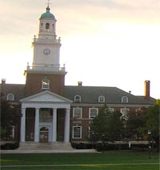 Want more info about Johns Hopkins University? Get free advice from education experts and Noodle community members. What do you like about JHU's campus and culture? If I am not taking any AP classes, could I still be accepted?